Looks very similar. Except I don't think mine is marked 'US'. I'll have to find it & have a look. You getting one? I went grocery shopping today. 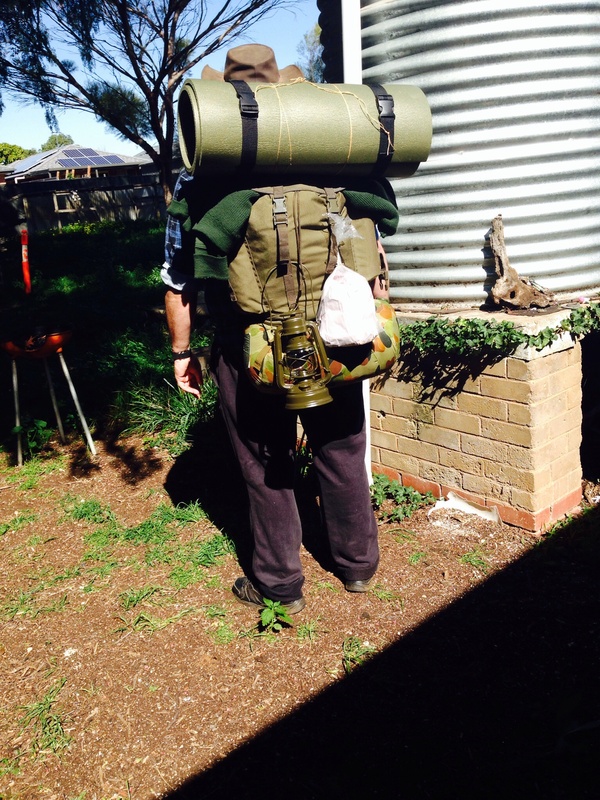 Why take the car when you can walk in style with a genuine German Army Mountain Rucksack (Bundeswehr Gebirgsjager)? Dubbed, 'the Mora Knife of packs!'. Can you show the harness? Does it have any sort of soft or hard frame? Ah, checked it out online - it looks good. I hope mine isn't a repro. Mine is meant to be genuine surplus (and un-used). At least that's what they said! But I got mine 9 months ago. I don't know what they are selling now though. Can you show the harness? Does it have any sort of soft or hard frame? Hey Randall. Yes and no. 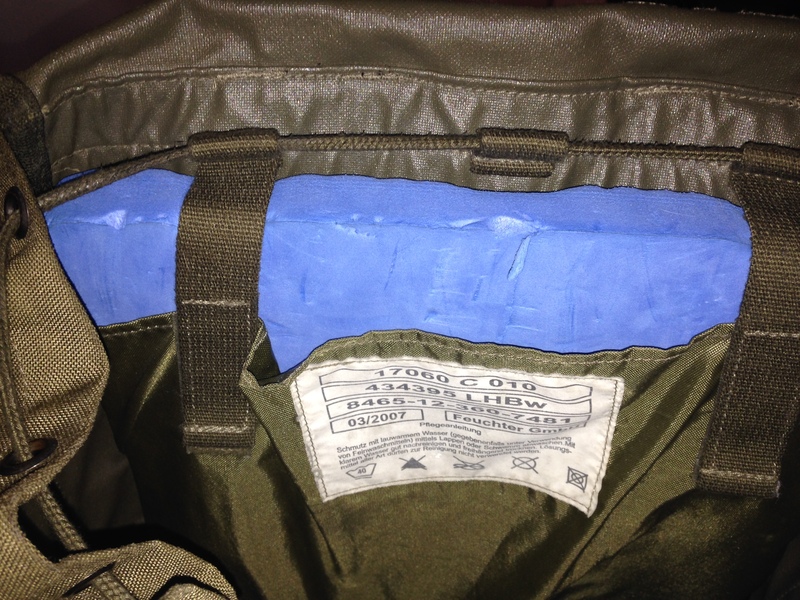 When issued they come with a fold-able sleeping mat that doubles as a frame for the pack. It is stored in a special pouch inside & near the back of the pack. You can buy them separately on the 'decommissioned' market. What many blokes do, & as I did, is buy a piece of closed cell foam from Clark Rubber & put it inside the pack, which 'acts' as a frame. But there is no actual fixed steel or polymer frame in these packs. After an overnighter with this pack, experience has shown I am probably going to ditch my piece of foam & buy the foldable pad/frame, as I find I need the room with this pack, as once I attach my closed cell foam & sleeping bag externally its just too cumbersome & looks ridiculous (see pics of a trip I did with this pack for what I mean). As you can see the pack gets a bit cumbersome when loaded like this. If I had the foldable internal sleep pad I wouldn't have to have the closed cell foam roll on top of it here! However, experienced reviewers have said, as this pack is on the medium size you can attach things too it that wont get in the way of your legs or bounce around on your bum, as they can do with larger packs. Just something I found interesting & good to know from people who have real field experience with larger packs & this packs. During this trip the pack carried enough food for 3 days. 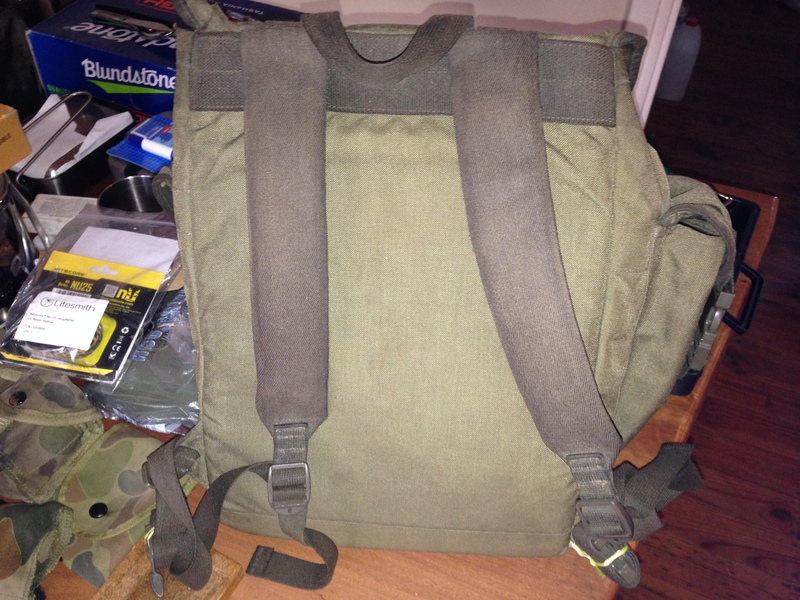 If you want a traditional framed military issued pack, or a larger pack, maybe consider a Swedish Army LK35 and LK50. Excellent packs for strapping external stuff The Swiss also make some good quality classic looking military packs. If you want a high quality, classical traditional but military inspired civilian pack look into a Swedish company called Fjallraven, but you pay for these. There are many options of course. As you probably know, environment & personal preference will also play a big part in selecting the right pack for you. Sorry Randall, I should have answered your post properly! Here you go. Its nothing special, yet it is. The stitching on this pack is extremely overdone. Its very strong. Varestelleka of Finland tested the pack using a forkflit. It managed to lift 200 pounds+ no problems, even from the side pockets! It has a waist strap I keep folded up. The buckles for the main flap have an ingenious fold over design, so you dont have to keep adjusting them, you just roll them to adjust them, or you can adjust them. Hard to explain. See reviews. 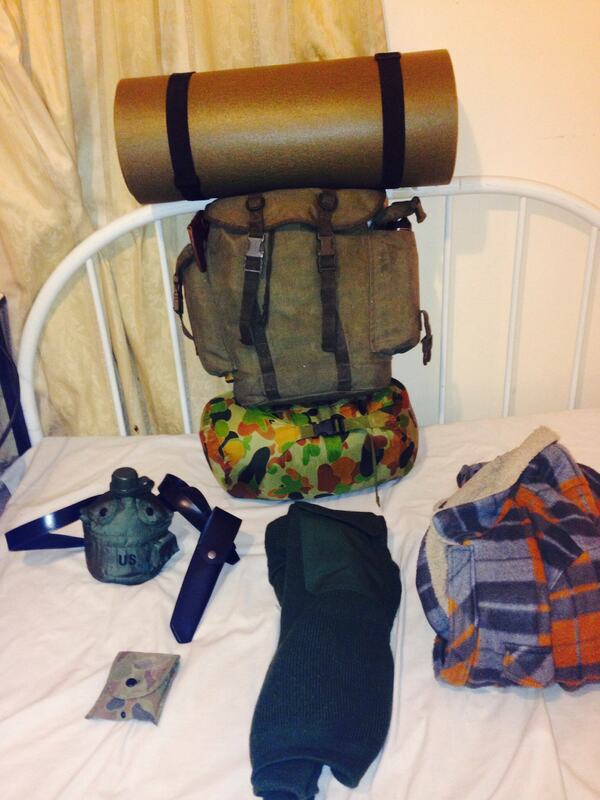 Thought I would show what is in my kit bag as I have already shown what I carry for a day trip in my backpack. 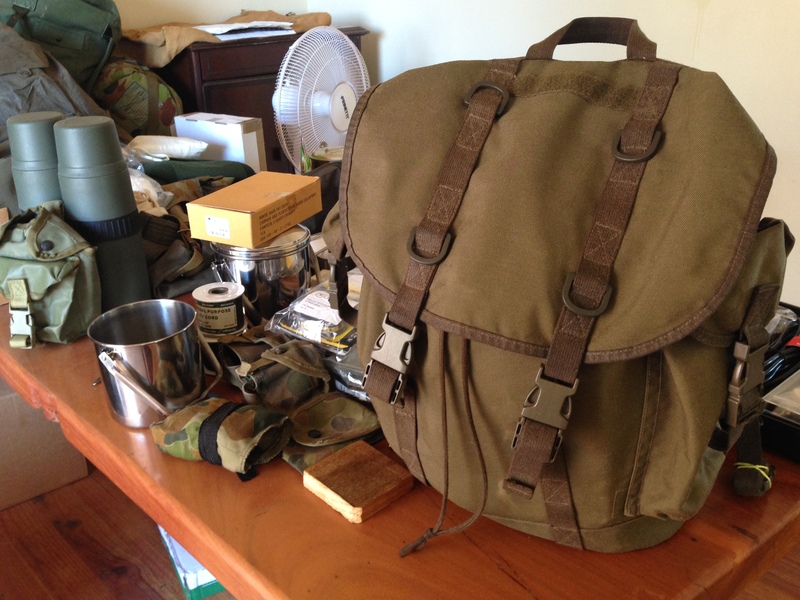 This is the Hill People Gear kit bag, one of my favourite bits of gear. Mini first aid kit, just has basic things like bandaids, ask Thrud how he knows. I got this idea from Mors Kochanski, he carries a small kit in his pocket seperate to his main kit. There are also some ranger beads clipped into the bag and I carry some blanket pins clipped inside the bag also. Do you know why I like having external stuff? I can dump it at base camp & then I could go scouting from my area with my main pack, without the need for a second pack as some carry. You have it well sorted out. Yes, that is a problem with tight bush, having to pack everything in. Unlike you, if I'm at the bottom of a peak and want to go up and back, I have to pull out a foldable day pack, hopefully pre packed for the hike up and back. Much different country. MDU - I like that you have room left. I always try to pack like that. Can you explain your trowel; it looks multi purpose? I've just played with my kit. I have an urban type kit with useful stuff that will be used fairly often - it's a small bag, like 100 - 200gm. I've also made a 2nd similar sized bag, with emergency type stuff for when I'm on the mtb or in the bush in general. Bandage, triangular bandage, ferro rod, dressings, space blanket, very large orange garbage bag etc. I always have the urban bag; if I'm going to be isolated, I toss in the other one too. White wine casks are ok, just give them a good rinse. 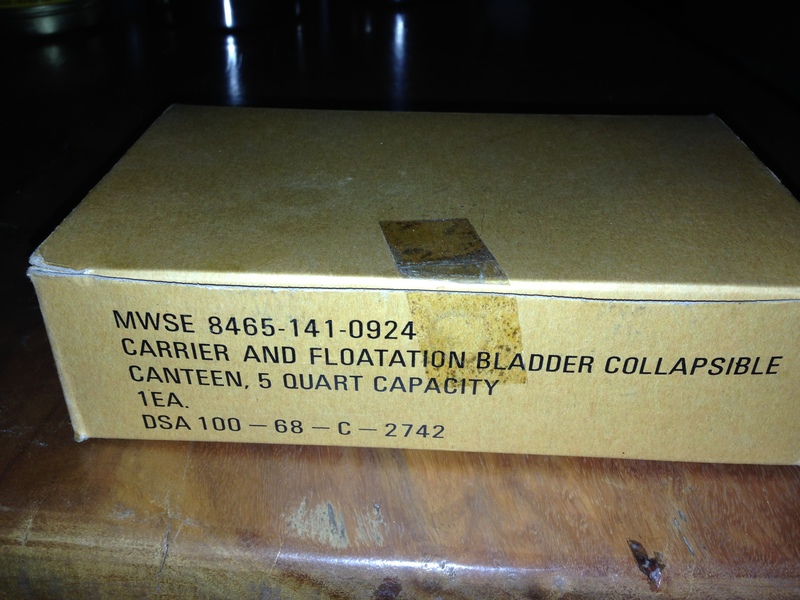 I have a few now and they are quite handy for hauling water to the camp. Have to be a bit careful though if carrying them in a pack for prolonged periods as they can split if to much pressure is put on them. Survival blankets are pretty good for keeping the hot sun off as well. Trowel has teeth on the side for cutting through roots, it also has a notch at the top so can be used as a stake for a tarp or tent. It is a Vargo Dig Dig Tool if you are looking for one. I have a pen. It's described as a tactical pen. It could indeed pokes holes in heads or other body parts. I was trying to find things for my kit that can be used for alternate uses. This has the obligatory glass breaker on the end; unlike many others, this one is ready to go with cap on. The top of the cap is fairly big, to give some place to put your thumb pad. It's a strong design and could easily poke holes in tins or thin sheetmetal. Because of it's design it also has a fair bit of lateral strength - it could easily be used on a tourniquet at short notice, or similar type rope work. It's also a good pen, I like using it. When the ink runs out I can replace the insert with a fisher space pen insert. The other thing is, this lives in my day pack that I use for everything; walking, mtb, motorbike, social events. Quite a few times I've landed on my pack from varying heights. I have broken some things. So now I try to get tough stuff . The pen is clipped in a vertical pen slot in a front pocket, so it shouldn't stab me when I fall. I wouldn't pack it loose And the slot it's in, it doesn't reach the bottom. Over time that tip would chew a hole through whatever it's in contact with. If the slot wasn't long enough, I could put a small plastic lid off something down there to the bottom. It was $7.70; I bought it with other stuff from gearbest. Nice. I was looking at tac pens a while back. I didn't see anything that took my fancy, but I like that bamboo body. It looks very grippy to me! Is the main body aluminium?